Whether your business is changing venues or you’re getting new home address, moving can be stressful! Thankfully, Bankers Box offers three helpful tips to make sure your move is successful. The worst mistake any newbie packer can make is overpacking boxes. As a general rule, your box should not weight more 50 pounds. You should also be able to test this with the shove method. If you cannot shove it, you have too much in it. Remember that even if you have movers, you will most likely still end up moving your box from room-to-room. It’s just good practice to ensure that you can safely lift all your boxes. SMALL Boxes are ideal for compact or heavy items. Safely, you can carry the full 50 pounds or under. This box is great for books, tools or dishes. Great for moving your kitchen or breakroom. MEDIUM Boxes are meant for mid-weight items. In the home, this could mean anything from toys to clothing or shoes. In an office, reach for mouse pads, keyboards, coat hangers and other small supplies. LARGE Boxes are for light-weight or bulky items. These will be items such as bedding, linens, pillows or towels. 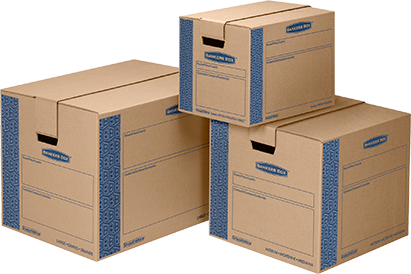 For the workplace, light-weight janitorial and sanitation supplies are most easily transferred in large boxes. The worst thing that can happen during a move is struggling with the assembly of boxes themselves. With Bankers Boxes’ SmoothMove, you no longer have to deal with tape. Instead, this box has an easy set-up. Just pop the box open and push down the bottom cardboard flap.